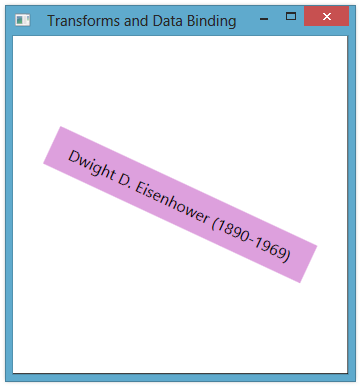 It’s common to use data binding to control the values used for 2D transformations. Below is a simple example that binds the Angle, CenterX and CenterY properties of a RotateTransform to corresponding properties in a class. <Label Content="Dwight D. Eisenhower (1890-1969)" Background="Plum" Margin="10"